Transform your home with an attractive upgrade from our beautiful collections of stylish and durable ceramic tile flooring. The flooring specialists at our store understand that you want the finest floor coverings available for your home, and we go the extra mile to ensure your flooring purchase satisfies in every respect—including looks, performance, and price. Our team is here for you at every step of your design journey, and that includes professional ceramic tile installation. We take the time to listen closely to your needs, so that we are able to find the ceramic floor tile that works best with your interior décor. Ceramic tile floors are easy to care for and look great for years to come. Creating a smooth, finished, and appealing look in your home is now easier than ever when you take advantage of our ceramic tile installation process. When you rely on a team with the most advanced tools and years of experience, you get a finished product that will last for generations. 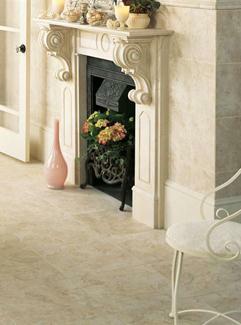 Our ceramic tile flooring is easily cut into a variety of patterns and shapes. This allows you to create original kitchen backsplashes and exclusive patterns that are impossible with other types of flooring. Once the installation process is complete, you are now able to enjoy a surface that is easy to clean and care for. Purchase high-quality tile at our most reasonable pricing from major names like Daltile™ and Happy Floors™. We enjoy the buying power of belonging to a major flooring cooperative and pass the significant savings along to our customers. Choose the right type of flooring for your individual approach to life with the help of our design team. When you have a busy family with kids and pets, the ease of maintenance that ceramic floor tile affords is unmatched. In addition, these floors are easy on those with asthma, allergies, or any kind of respiratory issue. Ceramic tile is easy to clean with just some warm water and a mop. It doesn’t take hours of scrubbing when you take advantage of the resiliency of tile flooring made from ceramic. When your home is free of the dust and dander that gets caught up in other types of flooring, your family will also breathe easier. Expand the goals of your next design project and fill your home with the timeless appeal of ceramic tile floors. With a huge selection of colors, designs, and textures to choose from, the creative possibilities afforded by ceramic tile floors are almost limitless. Ceramic tile has been the choice of discerning decorators for centuries, and now this classic flooring option can make a difference in your home. Replace your dull and dirty floors and restore the value and appeal of your home with our value-added flooring products. We have everything you are in the market for, including hardwood flooring. Learn why our customers recommend us to their friends by visiting our showroom today. You’ll be glad you did. Contact us today and download our free style app for more help in choosing the best ceramic tile flooring for your home. We proudly serve the communities of Highland, Troy, Greenville, Trenton, and the Breese & Carlyle areas in Illinois.